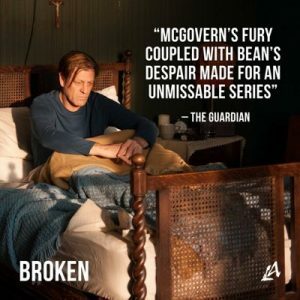 Home / Sean News / Why you need to see SEAN BEAN’S award winng performance in BROKEN. Even it your NOT a FAN of SEAN BEAN you will be astonished at his command over the deep dark emotions that Father Kerrigan conveys to the audience. Sean portrays a Catholic Priest in a northern English parish trying to serve his weary, poverty stricken flock while wrestling with his own demons. Broken is written by the brilliant JIMMY McGOVERN who is the KING OF CLASS DESPAIR. He is some how able to depict humanity and compassion in even the most desperate circumstances. Jimmy and Sean have created a compelling drama that takes on the biggest problems of the Catholic church in a brutally honest way. After watching Sean (Kerrigan) as he confronts the priest who molested him as a child I felt that I had been punched repeatedly in the stomach by this extremely painful and exhausting scene. But it needed to be shown for the healing to start. It’s amazing to me that Sean can tackle this kind of gut wrenching painful stories, but I’m glad he does so that all of us can understand how difficult this event can have on a person and how the damage goes on forever !! Thank you Jimmy and SEAN for making us look at what we don’t want to see or feel.